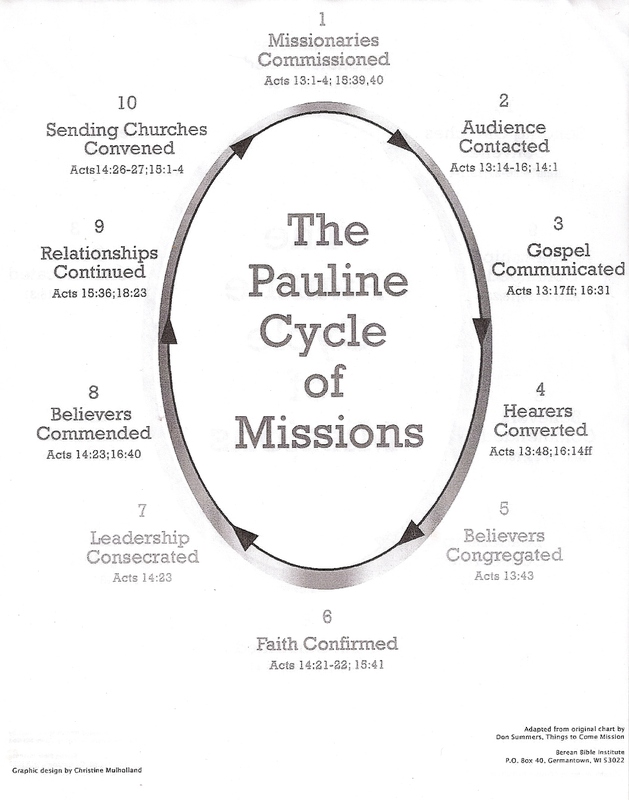 The Pauline Cycle: A must for any church engaging in missions. And when they had appointed and ordained elders for them in each church with prayer and fasting, they committed them to the Lord in Whom they had come to believe [being full of joyful trust that He is the Christ, the Messiah]. In his book Planting Churches Cross-Culturally, Hesselgrave emphasizes that the Apostle Paul did have an approach for church planting that needs to be implemented in our modern view of church planting today. The author gives a chart that he called “The Pauline Cycle.” It’s comprised of ten logical elements that were used in Paul’s master plan of evangelism. These elements are: 1) Missionaries Commissioned: (2) Audience Contacted, (3) The Gospel Communicated: (4) Hearers Converted: (5) Believers Congregated: (6) Faith Confirmed: (7) Leadership Consecrated: (8) Believers Commended: (9) Relationships Continued: and (10) Sending Churches Convened. Hesselgrave wants to assure his readers that these basic principles implemented by Paul are never out of date, and that missionaries today will greatly benefit themselves and others by using Paul’s method of evangelism and church planting. The author believes that the first-century world in which Paul ministered was fairly similar to the world today. He wants to stir his readers to learn from the work and method of Paul in church planting. These methods implemented by the greatest of all apostles and guided by the Spirit of God are never out-of date.